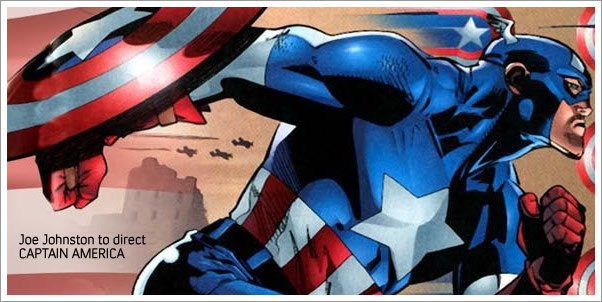 Tracksounds: Joe Johnston to direct Captain America. Who should score it? Joe Johnston to direct Captain America. Who should score it? One of the next big Superhero film franchises is fast approaching. And I'm not talking about Wonder Woman starring Beyonce either. The feature film version of our beloved CAPTAIN AMERICA is reportedly being directed by Joe Johnston. With films like THE ROCKETEER under his belt...I can see this as a potentially good fit. I also love OCTOBER SKY, so if he can bring that sort of humanity to the project, this could be really interesting. My biggest concern (yes even bigger than WHO plays Cap) is how do you get that costume to work on screen? OK...they got Spidey's costume to work (I guess) on screen, but just not sure how they are going to pull this off. I sure don't want to see a fully CG Capt. running around during the action scenes. He's not encased in iron, nor does he turn into a green behemoth, so please keep him real and NOT go the way of Spidey in that regard. As tough as this costuming issue might be, I'd rather have to figure out this for Capt. America, than Thor. Good luck on that one, Brannagh. Now with Joe Johnston at the helm, who do you think he'll get to score the movie? Some of his past collaborators have been James Horner, James Newton Howard, and Don Davis. By far, he's worked with Horner the most. Do you think this would be a good match? If not, then who?